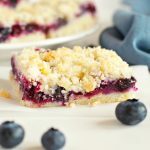 These Best Ever Blueberry Crumb Bars are deliciously sweet and tender, and so easy to make! Preheat your oven to 350 degrees Fahrenheit and prepare a 9-inch by 13-inch rectangular baking dish, greasing it with butter and lining it with parchment paper. In a large bowl combine the flour, sugar, baking powder, salt, cinnamon and nutmeg with a wire whisk. Add the cold butter to the flour mixture in chunks, blending it in with a pastry cutter or a fork until the mixture resembles coarse crumbs. Beat the egg in a small bowl and add it to the flour and butter mixture, mixing just until combined. Press half of this mixture tightly into the bottom of the prepared baking pan and set the other half aside. In a separate bowl, combine the fresh blueberries, white sugar, cornstarch, and lemon juice and toss well. Pour the blueberry mixture over the bottom crust you've just pressed into the baking pan. Pour the remaining flour mixture over the blueberry layer and very gently press the flour mixture down onto the blueberries, just a little bit. Bake at 350 degrees Fahrenheit for about 45 minutes, or until the top crust is just barely golden brown. Let the bars cool completely in the pan before cutting into them or trying to remove them from the pan - they'll continue to bake a little after you've removed them from the oven and they'll need to cool in order to maintain their shape. Once cool, cut them into 12 bars and serve. These bars are best stored in an airtight container at room temperature for no more than 2-3 days, and can be frozen for up to a month.